Medical grade x-ray chemistry. Premixed ready to go for low volume clinics by Fischer Industries. 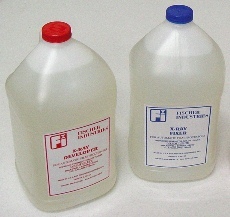 Kodak chemicals (5 gallon mixes with water) for medium to high volume clinics. FI fixer is conveniently premixed and extremly stable. Suitable for general x-ray processing. 6 month shelf life at room temperature! 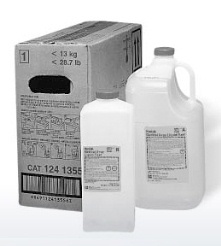 Combination case = two one gallon jugs of premixed x-ray developer plus two one gallon jugs of premixed x-ray fixer. FI developer is conveniently premixed and extremly stable. Suitable for general x-ray processing. 6 month shelf life at room temperature! Includes 1 case = four one gallon jugs of premixed x-ray developer. Includes 1 case = four one gallon jugs of premixed x-ray fixer. 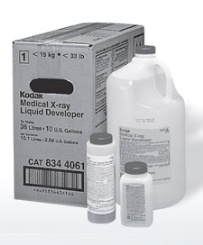 KODAK medical x-ray developer and replenisher is made with the same quality controls used for high-performance processing chemicals. This developer yields consistent high image quality and versatility with most general radiography films. Use for standard and rapid cycles, general radiography and laser imaging film, and KODAK film, plus other manufacturers’ film. Carestream Health specifies this affordable fixer with the same quality standards used for high-performance processing chemicals.